For many collectors, this time of year is all about prospecting. With the recent releases of 2018 Elite Extra Edition and 2018 Bowman Draft, prospectors are clamoring for the first cards of many players taken in last June’s 2018 MLB Draft. MLB.com has already released their Top 50 Draft prospects for the 2019 draft. Would you believe that many of these prospects already have cards? While plenty can change in terms of draft rankings in six months, if you’re an uber-prospector, you may want to get an early jump on some of these players. The top-ranked prospect according to MLB.com is the 20-year-old junior catcher who was previously drafted in the 40th round of the 2016 draft by Seattle. 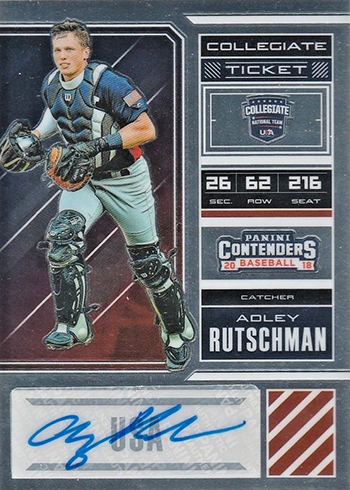 Kudos to Panini America for including Rutschman in 2018 Elite Extra Edition where he has 15 cards as a member of the USA Baseball Collegiate team. His 2018 Elite Extra Edition Contenders USA Collegiate Tickets Signatures and 2018 Elite Extra Edition USA Collegiate Silhouette Autographs cards, both limited to 99 copies, have been strong sellers in the $25-$60 range. 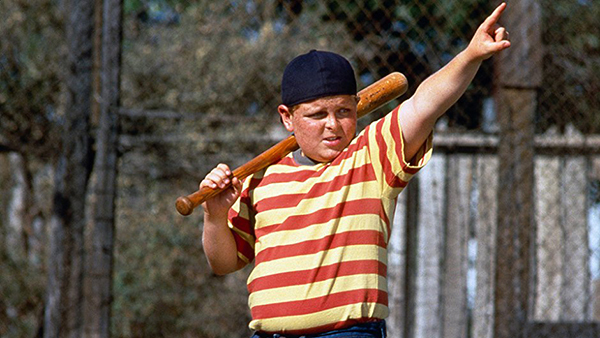 The second overall prospect, and top-ranked high schooler, is the son of former Texas Ranger great Bobby Witt. He’s committed to the University of Oklahoma, but that could change come June. Witt Jr. already has 70 cards in the Online Price Guide from 2018 Elite Extra Edition, 2018 Leaf Perfect Game and 2018 USA Baseball Stars and Stripes. 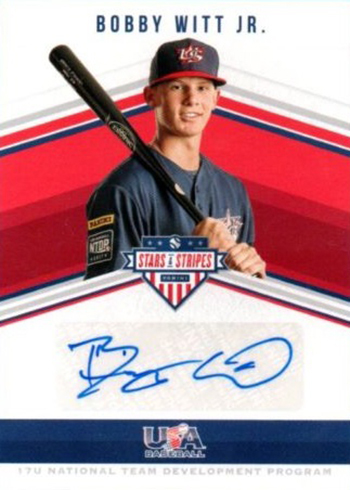 Both his 2018 Elite Extra Edition USA Baseball 18U Signatures (/99) and his 2018 USA Baseball Stars and Stripes 17U Signatures (/181) have been collector favorites at $20-$50. The former PAC-12 Freshman of the year, Vaughn won the Golden Spikes Award in 2018 as sophomore, hitting .402 with 23 home runs. 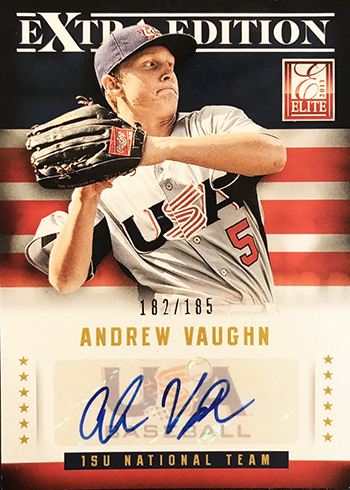 Vaughn has 96 cards in the Online Price Guide dating all the way back to 2013 Elite Extra Edition, when he was a member of the 15U USA Baseball team. He also appears in 2018 Elite Extra Edition and 2018 USA Baseball Stars and Stripes, among others. His 2013 Elite Extra Edition USA Baseball 15U Signatures (/185) can be difficult to track down, but is priced at an affordable $15-$40. TagsAdley RutschmanAndrew VaughnBobby Witt Jr.